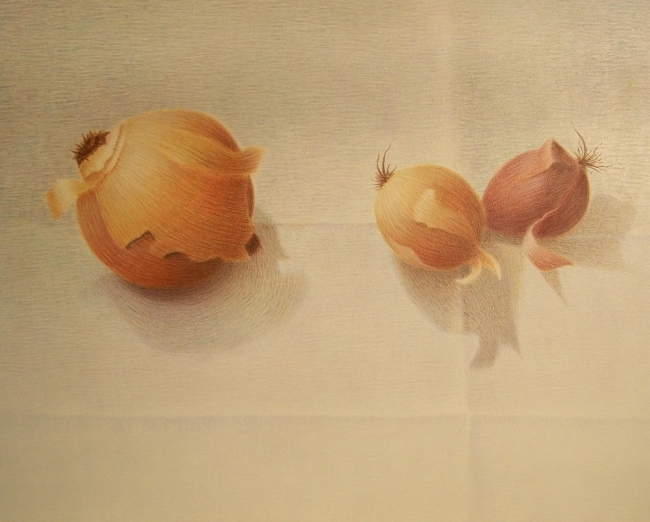 Egg tempera on gesso panel, 8" x 10"
I love painting onions because of the transulucency of their skin and because the subtle sheen of their surface is expecially simpatico with egg tempera. Here, the tawny gold and deep red violet of the onions provide an interesting contrast to the neutral tones of the table cloth. As you can tell from the title of this work, even when painting inanimate objects, I can't prevent my love of narrative from creeping in.